With the mass-production of globes in the 20th Century, and the transition of maps to a screen on a car dashboard, it is easy to forget what glorious works of art they once were. 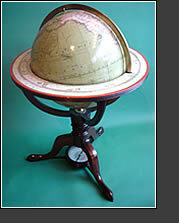 We stock representative examples of table, library and pocket globes, all expertly restored and with fine original colour. Both terrestrial and celestial are available. With maps we concentrate on unusual and decorative specimens, especialy those showing birds-eye views.